We previously told you all about Barrel Roll, and how the toy was based on a real guy. Today we meet his traitorous brother, Black Out. Black Out washed out as a candidate for the GI Joe team when he failed his psychological exam. Disgruntled because his younger brother Barrel Roll made the team, he turned to Cobra, where the faults that disqualified him for GI Joe were considered assets. All of his records are sealed, but it is believed that the reason for his rejection had to do with his possible involvement in the disappearance of his sister, Cadet Bombshell. His expertise with long-range sniper rifles is the result of his obsession with accuracy. Black Out has no natural talent for stalking or shooting, but persistence and practice have resulted in a high level of proficiency that is never sparked by any flashes of brilliance. Cold and mechanical, he mistakenly believes that playing all the notes correctly and at the right time is what makes a song. Now, to be fair, Thomas Stall probably isn't a traitor in real life - maybe he just always prefered to play with the Cobra toys when the brothers were little, and this is Dwight's way of poking fun at him. Who knows? What we do know is that the character's rejection from the Joe team had nothing to do with Bombstrike: he freaked out during a mission when he was still a Greenshirt, and got two of his teammates killed. He was facing a court martial, but escaped the stockade when Cobra attacked, and ended up going with them because he knew his military career was over. Of course, that story didn't come out until a year after the filecard, so things can change. Black Out wears a pretty ornate uniform, so his body is unique. Well, it was new when it came out: it was reused a few years later for Major Bludd, but it's not like he's just a repainted Viper or something. The suit is black, with silver armor panels - all very ornate. He has high lace-up boots, and a ton of pockets and pouches hanging from his belt. Not "Image Comics" style pouches, but stuff that looks like a military man would actually carry it. 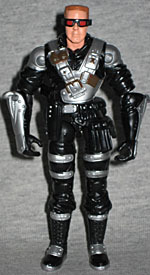 The armor on his forearms has large molded Cobra symbols, and his asymmetrical vest is adorned with grenades and a small knife. The facial sculpt is really impressive, especially for a G2 figure. Now, obviously I don't know what Thomas Stall looks like in real life, but the figure has a very distinctive face and a haircut you could set your watch to. He's kind of reminiscent of a young Dan Akroyd, of all things. If this is based on the real-life guy, then he was probably laser-scanned at Hasbro's headquarters in Pawtucket; if he's just made up, then the unknown sculptor did a good job. Black Out's articulation is the classic GI Joe assortment, since he came out before the G2 figures started getting ankles and wrists. Anyway, that means he has a balljointed neck, shoulders, elbows and hips, hinged knees and an O-ring waist. The upper arm swivel is right above the elbow hinge, rather than midway up the bicep, as it was on the G1 toys. Showing a keen attention to detail, the engineering on the forearms is slightly different: on the right arm, the palm of his hand is parallel to the hinge; on the left, it's perpendicular. Why's that? So he can better hold his weapons. Yes, as a Cobra sniper, Black Out gets a decent amount of weapons. For instance, a silver AK-47 and a black pistol that (almost) fits in the holster on his belt. It's actually a little too big to fit properly. His main weapon is a German-made DSR-Precision GmbH DSR 1 with a removable bipod. He's also got a pair of goggles, same that later came with Low Light, and a ghillie suit that's really tricky to get on him because of the giant armor on his elbows. Black Out was an easy figure to miss when he came out in 2003 - paired with a rather staid Flint as a part of the SpyTroops line (but without any SpyTroops gear), there really wasn't anything to make him stand out. The idea of a sniper who gets fed up and joins Cobra to get revenge on the Joes may remind you of Doctor Fumbles, but Black Out is pretty cool. He became a big player in the Devil's Due comics, though, as a member of The Plague during the tremendous World War III story. This is the only figure Black Out has ever had, and it's not easy to find; if you do track one down, however, you'll find a good sample of a G2 Joe, with an impressive sculpt and a few nice accessories.